This is my kind of salad, with a bit of everything and never to be mistaken for a side dish. I like to eat salads that are a bit more than a bunch of greens. The fact that this is called a salad might be deceiving. 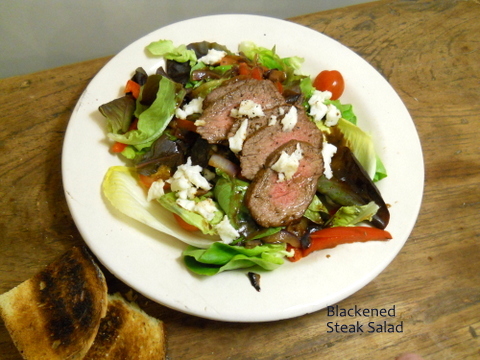 I know there are greens involved and a dressing, and that I put a lot of both on my plate, but a whole blackened steak on top kind of changes the idea of a simple salad. Blackened and steak are two words I am very interested in when it comes to cooking. Not only the flavors are wonderful, but there´s no chance you will get a lame colored piece of meat. This is dark, smoky and almost burnt. Amazing to add to a bed of butter lettuce, endives, sauteed onions and peppers, tomatoes and feta cheese. The spice mixture to `blacken´ the meat is very simple. I happen to have all ingredients in my pantry at all times. The sliced onion I cook together with the meat. When I turn the steak, I throw in the onions and kind of push them to the sides and let them turn a nice golden color. I sometimes throw in sliced mushrooms if I have some in the fridge. We all know how those tend to loose their charm if not used quickly. It is a salad that will make a great addition to a buffet table. And of course, if you happen to have leftover steak, a fantastic sandwich awaits you the next day. 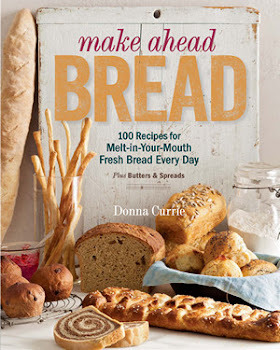 This is a heartfelt guest post, as Donna is going through some challenging times. I met her through Sunday Supper and her wit and experience were immediately felt. It´s wonderful to see so many of her friends come to her side. My thoughts are with both of you Donna. Mix all dressing ingredients in a small jar and keep refrigerated. Combine all spice mixture ingredients in small bowl. Rub over all sides of steaks. Heat butter or oil in a large skillet over medium heat. Add steaks and cook 3 to 4 minutes on one side. Turn the meat and add the onions and peppers to the same skillet. Cook the meat another 3 to 4 minutes, for medium rare. Remove from heat and let rest 5 to 10 minutes. Cut steaks thinly crosswise. Arrange lettuces and endives on each plate and add dressing. Add onions and peppers. Arrange sliced meat on top and sprinkle with cherry tomatoes and feta cheese.